Visit Diana's blog: http://diananatters.blogspot.com for all kinds of machine knitting tips, patterns, links to instructional videos, photographs... WARNING: Blog contains inordinate numbers of knitting posts and a strange contagious enthusiasm for knitting, and exposure may lead to AKBD (addictive knitting behavior disorder). Mid-Gauge Mastery - New book + 2 DVDs (5 hours) with great MG projects! U.S. SHIPPING: We mail items each weekday using U. S. Postal Service. In the United States, we charge $3 to ship an order. If you need other items, you can save on shipping - when a customer orders more than one item at the same time, additional items are shipped free of charge. Heavier U.S. orders are sent media mail. PRIORITY MAIL shipping is $4.90 for the first item, and additional items ship free. SALES TAX applies in Texas. INTERNATIONAL SHIPPING: These DVD courses are shipped First Class International, and the postage is $13.75 for the first item (additional items ship free). Allow 2-3 weeks for delivery. Many countries have delivery within a couple weeks, but some of the more distant destinations like Australia often take the full three weeks. Your are responsible for any customs fees, duties or VAT that your country charges. This is a book with thirteen project patterns plus two DVDs with 5 hours of detailed knitting instructions to make terrific projects on your mid-gauge knitting machine. Like The Goldilocks Challenge, this is another progressive project book. If you want to learn to knit or teach a friend to knit, work these projects in order. The easiest projects are at the beginning of the book and the patterns get more complex and introduce more interes ting techniques as you go. The book starts with three afghans - a baby blanket with a super-easy clever edging and join technique, and then a fancier baby blanket with strings of hearts joining and edging the panels. The third afghan is a great stash-buster, gift or charity project - it uses several thin, industrial cone yarns and a plying technique to quickly make a giant, "man-sized" afghan. The panels are joined using a beautiful sew-as-you-go cable join, and then the blanket is edged with a cable edging. 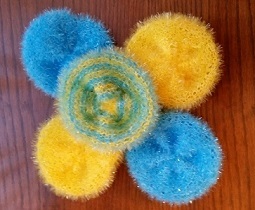 Next, for a fast and addictive project, whip up colorful, sparkly kitchen scrubbies using Red Heart Scrubby yarn. You won't believe how fast these make up, and it's a good thing, too, because once you give some away you will be asked to make more. 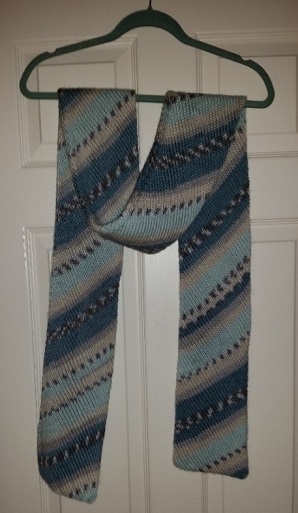 The Diagonal Mid-Gauge Scarf is a warm, doubled scarf made with an easy but very interesting bias technique. With this little project, you can learn seaming and grafting. Diana made hers with a beautiful self-striping alpaca-blend yarn, which results in bias striping patterns without any extra ends to hide. Get experience hand-tooling lace on the mid-gauge and make the warm Lace Edge Shawl. It is a generously sized triangle shawl with remarkably perfect-looking point where the lace turns the corner! It also features an easy built-in rolled edge. Lots of readers have asked for Baby Pants, and here they are. This is a fast, easy little project and really rounds out a baby gift when you combine it with the hat and sweater. Check out the girly version with scalloped hems. The Baby Raglan Pullover is quickly made. 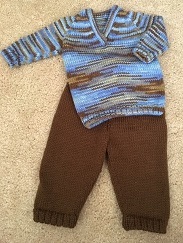 It covers most of the techniques you'd need to make any pullover sweater, plus three neckline options - a lapped neckline, a mitered neckline, and a scalloped collar neckline to go with the girly baby pants. The Earflap Hat, with baby to adult sizes, has a doubled, short-rowed earflap to keep ears warm. There are two options for smooth crown shaping, a garter bar method or a faster needle-out-of-work method. 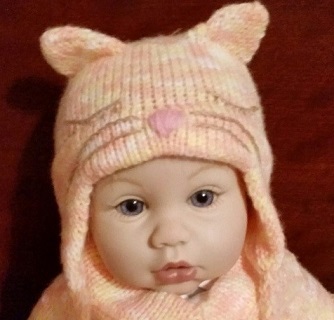 The Baby Kitty Hat is a whimsical hat with kitten ears and a simple embroidered face. There's a mitten, too, in seven sizes, with a shaped palm and a very comfortable thumb easily attached with more sew-as-you-go tricks. Just for fun, make the Felted Oven Mitt by knitting a big size loosely with a feltable wool and felt it down to the fit and thickness you want. 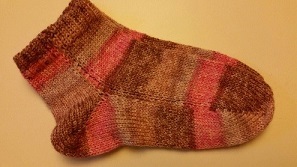 The most advanced project in the book is a sew-as-you-go sock - yes, a sock on your mid-gauge! This course is now available, a resource for all knitters, beginners, experts, hand and machine knitters alike. Wouldn't you love to just relax and enjoy the sewing up process on your knits, confident that you can assemble them expertly? This set of videos has the information to help you make your investment of time and materials turn out as beautifully as possible and give your projects a "blue ribbon" finish. This course is also a resource for when you encounter some of the less common situations, like making horizontal, invisible ribbing grafts. You can use this course by making swatches and practicing the techniques, or as a reference when you need a specific technique. Perhaps you'd like to show it at your club meetings and then practice with your friends. Note that I do some things in about the same way as any other knitting teacher, but I also do a lot of things with a different approach. Some more experienced knitters may enjoy seeing a different way to do the job, especially if it helps make the seams invisible. I have longed to produce a course like this for years, as I listened to knitters talk about their finishing experiences and their need for up-close lessons. The two DVDs have over four hours of video lessons, all hand assembly techniques. Mattress Stitch: In the photo, that's an underarm shot of the side seam done with one-row mattress. Mattress is the way to get side seams that are invisible on the right side. I show mattress on stockinette stitch, on reverse stockinette, on a shaped edge, and along a full-fashion decrease edge. Later on the disk, I work it with knit one, purl one ribbing and knit two purl two ribbing, just showing how to plan ahead or even adjust so the ribbing forms an unbroken pattern. Hide Yarn Ends: A lesson on hiding ends with a needle and then one using the latch tool. Kitchener Stitch (Grafting): Kitchener is a stitch that acts just like a row of knitting, but is sewn in with a needle, for a wonderful invisible seam. 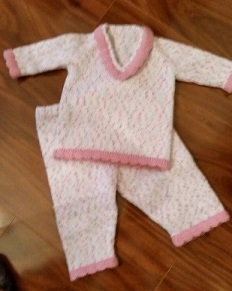 The videos teach purl side grafting, knit side grafting, and Kitchener for a growth line in children's garments. Did you know that you can graft ribbing invisibly, as long as you can graft from waste yarn at the bottom of a piece to waste yarn at the top? We start grafting ribbing with knit one, purl one and go on to knit two, purl two ribbing. Grafting Ribs Top to Top: I begin by demonstrating the challenge of grafting pieces of knitting with open top stitches, showing how knit one, purl one doesn't work out well if grafted in the usual way, because the stitches will be offset by a half stitch. Instead, there's a method called the "four-needle graft" that I show using a waste yarn string through the stitches that gives a virtually invisible graft. Mobius Scarf and Garter Grafting: Garter stitch is easy to graft invisibly, and there just had to be one project on the disk. I have a simple, hand knitted garter stitch Mobius scarf (with nice, big easy-to-see stitches) that I begin and end on waste yarn and use to demonstrate the Kitchener Stitch on garter stitch. Right Angle Seams: This is a mattress stitch for those situations where the two pieces are quite unlike, but you still want them to look even and tidy. Knit 3, Purl 3 Graft Top to Top: Here's how to deal with wider ribs that need grafted top to top. Three-Needle Bind Off: Using knitting needles, I demonstrate the three-needle bind-off. I call some of these seams "dent" seams, and I like invisible ones better, but this is an easy technique when you need a sturdy seam. Crochet Seam Like Three-Needle Bind Off: I demonstrate this two ways, taking the stitches off knitting needles and also by working from waste yarn. Separating Jacket Zipper: Here's an exposed coil installation of a separating jacket zipper, positioned with hand basting, then machine sewed. Blocking: Here is how to use blocking wires, pinning out to measurements, and then an explanation of several methods of blocking. I demonstrate steam blocking. Armhole Seam: This segment shows how to sew in a seam with mattress stitch. Bands and buttonholes: I show how to pick up and knit a band along a vertical edge, how to pick one up along a horizontal edge, and the math behind those processes. I show how to make a doubled neckband. (Warning: I used knitting needles here, because I wanted this course to be for all knitters.) Then I demonstrate three garter stitch buttonholes and two ribbed band buttonholes. PRICING: The two-DVD course is $25 plus shipping. This course contains over four hours of high definition video that looks crisp and clear even on a humongous television screen, showing how to do the techniques with detailed, up-close views. U.S. SHIPPING: We mail items each weekday using U. S. Postal Service. In the United States, we charge $3 to ship an order. If you need other items, you can save on shipping - when a customer orders more than one item at the same time, additional items are shipped free of charge. My other items are at www.dianaknits.com. The photo shows some of the blankets. My sample bag had twice this many, but you can only get so many in one photo. I hope this book will become one of your favorites, because it has a bunch of projects and some fun, different techniques. Baby Quillow - a "quilt" and folds into a "pillow," a fun introduction to quilted stitch using your ribbing attachment. This is a good one for standard and bulky gauge machines with a ribber and patterning device for knitters who want to try something quite different. Panels and Cables Blanket requires only a single bed machine. Put your panels together with a contrasting cable stitch, edge the blanket, and you're finished. Beginners can do this one, too, and it makes one of the best full-sized adult afghans if you want to enlarge it. For standard, mid-gauge, and bulky machines. Short-Rowed Pinwheel Blanket for standard, mid-gauge, and bulky machines. This only requires a main bed. You'll be surprised how quickly you can knit a sizeable, circular colorful blanket. Skill rating? Easy. Multicolored Tuck Stitch Blanket - Here's a great blanket with no ribber and no patterning device required, also an easy one. As I've shown these blankets to knitters, this is the most-requested pattern. I've included instructions for standard, mid-gauge, and bulky machines, instructions for doing it fast with a patterning device, and instructions for making the stitch by moving the needles by hand. Circular Swirl Blanket - this old favorite came back, and I dressed it up, featuring it for bulky and standard gauge, and filmed it on the standard gauge with a very unusual, optional circular ruffle trim made using your ribber. You can make this blanket with our without a ribber, though. Long Stitch Blanket for standard and bulky machines does require a ribber to make the simple, built-in edging that lies beautifully flat. You need to learn this edging! You'll find lots of other uses for it. Racked Ripple Blanket requires a machine with patterning and a ribber to knit a fascinating, puffy "ripple" stitch. 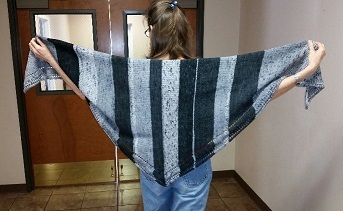 I tried this one with scraps, doing a zigzag stripe of each color and also with a planned color scheme. Reversible English Rib Blanket is for both bulky and standard gauge machines with a ribber. This warm, versatile pattern stitch can be whipped up quickly. Once you bind off and hide your starting and ending yarn ends, you're finished. Fisherman Rib Checked Blanket utilizes the patterning device to have blocks of fisherman rib and blocks of plain ribbing, plus a plain ribbed edging for a terrific, professional-looking fast project. I like all these tucked rib blankets best on the standard gauge machine for babies, but try them on your bulky for luxurious blankets for adults and older children! Waffles Baby Blanket and Wiggles Baby Blanket - two more terrific thermal ribber blankets. Waffles doesn't require patterning and can be hand-manipulated. Wiggles stitch is really similar, but uses patterning to add some variation and make the process more automatic. If you've purchased my products before, you know that I do full-color books with lie-flat coil bindings, include plenty of photos, avoid abbreviations, and use clear diagrams. The book and DVD come as a set for $25 plus shipping. This DVD contains three hours, twenty minutes of high definition video, that looks crisp and clear even on a humongous television screen, showing how to do the techniques, detailed, up-close views. Click here for shipping and Tax Information, both U.S. & International. Get more knitting done while having more fun! Diana's new book (just a book, no DVD this time) is a large compilation of machine knitting tips and information. Diana chose 100 favorite tips, ideas, and instructions gathered over my 35+ years of machine knitting, being a dealer, working with a club, and teaching seminars. Some of these are little things, some are more essential, but each one is a way to improve your machine knitting skills, reduce frustration, and generally enjoy the hobby more. This book will help you move toward mastery of machine knitting, fitting, and finishing, and make machine knitting much easier. It's a down-to-earth book - you start where you are with the equipment you already have or can afford to acquire, be practical about yarn, supplies, and tools, and enjoy making projects more. PRICING: The book is $25 plus shipping. Shipping of additional items in the same order is free. This is two high-definition DVDs, about 4 hours of video time. The Knit Leader is a Brother accessory that has been around forever, is widely available used, doesn't cost too much, and works best on Brother machines, although you could use it for other machines and hand knitting if you wanted to advance it by hand. I have been surprised at how many people have one and don't use it! It's a wonderful shortcut to making garments that fit. You draw your full-sized pattern on the mylar sheet, load the sheet in the Knit Leader, set the stitch and row gauge, and the Knit Leader guides you along the way, sort of a GPS for machine knitting. This course would transfer well if you have a Toyota Knit Tracer, because that one's very similar to Brother's unit, but it isn't recommended for Silver Reed half-scale Knit Tracers, which are too different. The two-DVD course is $25 plus shipping. Shipping of additional items in the same order is free. The new Footnotes book is finally finished and available! Slippers are just wonderful to knit for gifts. These are quick, inexpensive projects, personal and homey like apple pie and grandma hugs. So, what's in the book? Well, I have five slippers, all with 12 sizes apiece (children, women, men), and most of them in three gauges - standard gauge, mid-gauge, and bulky gauge. I did my usual charts where you pick out the color for your size and follow that column. In addition, I have narrative explanations of the techniques and a section with Kitchener and mattress stitch seams. The standard gauge slippers are knitted with typical hand knitting sock yarn; the mid-gauge ones use sport weight yarn, and the bulky ones, worsted weight yarn. Odds and ends from your knitting stash can become cute small projects. The first pattern is the "no sew" lined slipper, which comes off the machine all assembled. This slipper is a nice, smooth fit and absolutely addictive to knit. My knit club made bunches of them for charity, and I selfishly pulled a few out of my pile to give to loved ones. The second pattern is a cute little mocassin complete with a rather sentimental story about how it is a variation on the first pattern I ever wrote. Teaching someone to knit? 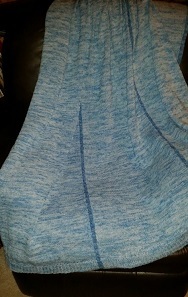 This one has a hem, an eyelet row, an idiot cord, short-rowing, and even a bit of sew-as-you-go edging, truly an interesting little pattern to make up. For ribber fans and high-volume charity knitters, I have an English Rib slipper, the Quick and Cozy Slipper, that knits up super fast and is warm. The Knit Natters made heaps of these for the soldiers. The last pattern is a sew-as-you-go slipper sock in bulky and sport weight yarn. But - if you want a regular short gym sock, make it up in regular sock yarn on your standard gauge! I did this sock a long time ago in a women's medium in a video, and folks have been asking for it in all the sizes since then, so finally, here it is in written form. If you use wool to knit the last pattern two tensions too big and two sizes too big and then felt (shrink) it, you have the warmest, thickest slipper of all. In case you are hesitant to try felting, this is your chance to get your feet wet, literally. Try these incredible shrinking cuddlers on your feet while they are still wet! The book is all in color, has lots of photos and diagrams, 32 pages, plastic spiral bound so it'll lie flat, as usual (that's what I like, so I'm sticking with it). The whole book is laid out the wide direction because of all the charts. There's also a detailed DVD, high-definition and close-up, showing how to do everything. There's no story, plot, scenery, or characters, just a long stream of up-close knitting techniques. Don't forget to add some non-slip treatment to the soles. I just scribble a little silicone seal or puff paint on the bottoms for safety. Many thanks to Tom Panciarello, who did testing and suggesting, the Knit Natters who are my most beloved guinea pigs, testing and suggesting, and my sweetie, John who proofread and helped with duplication. The book and DVD sset is $25 plus shipping. Shipping of additional items in the same order is free. Lots of machine knitters have realized that Entrelac is easy to do on the machine. All you need is a sensible, straightforward method and you're off and running. In fact, Entrelac is habit-forming! If you love round yoke pullovers, this book is for you. The round yokes are shaped Entrelac, easily made by changing the size of the blocks. 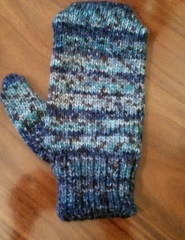 They are knitted using a seamless technique and waste yarn. The only triangles you have to do are at the top and bottom of the yoke. For most of the yoke, you only have to deal with a few needles in the center of the machine at a time! And, there is very, very little counting. The yokes are knitted first, starting with waste yarn, and then the body pieces are knitting working from the yoke down the sleeve or down the body to the hem. There is a special technique to make a beautiful transition from stockinette stitch to Entrelac. It's easy and it looks terrific, even up close, even though the Entrelac diamonds are a radically different gauge from the stockinette sleeves and body. The book contains both mid-gauge and bulky gauges and sizes for children, women and men. The sizes run from a child's 4 to a man's 48, limited only by the number of needles on a machine. To make it easier to follow a size, the book contains colored size charts. Find your gauge, then find your size, and it's easy to follow your column by looking for the color. The book also contains shaped Entrelac hats - an easy introduction to the technique. These are great-looking, warm hats with an excellent smooth crown technique to join the Entrelac blocks beautifully at the top of the head. These also come in sizes for children and adults in both mid-gauge and bulky gauges. Keeping to our commitment to quality products and no skimpy instructions, the set also includes detailed narrative instructions, lots of color photos, and a DVD with detailed, close-up video of how to knit these. Why the DVD? Well, our customers have been very emphatic that DVDs are tremendously helpful for following machine knitting instructions and techniques. DVDs work. We can put a tremendous amount of information on one 2-hour DVD, and we do! This one not only shows how to knit the hat and the yoke, it shows the sweater shaping and ribbing finishing. There is even an extra section about how to knit ribbing successfully - without a ribber - at the END of a knitted piece. The book and DVD set is $25 plus shipping. Shipping of additional items in the same order is free. Warning: These DVDs contain no car crashes or love interest, and no plot whatsoever. There is absolutely no reason to view them unless you want to master your knitting machine. As a matter of fact, this 2-DVD set of video lessons is exactly what a beginning machine knitter needs to become proficient quickly! These 35 lessons have been filmed very close-up in sharp detail, and Diana works slowly and explains each step. All the lessons except the standard gauge swatch lesson were filmed on a bulky machine with big needles to make things especially easy-to-see. They are intended for people who never machine knitted before. In other words, this is several hours of closeups of needles, yarn and hands. Click here to see a sample of the video. How can you get the most out of this course? Well, if you're a beginner, work at least one lesson every day - watch it, then knit it. Each lesson takes only a few minutes to watch and a few minutes to knit. Your mind continues to process the information and fill in the gaps between knitting sessions if you do a little each day - it's just something about the way we learn. After a month or so, you'll have all the hand and eye movements mastered, know the jargon, and be well beyond the beginner stage. In fact, you will probably know more basic knitting techniques than lots of people who have knitted for years but didn't have the opportunity to learn in a systematic way. 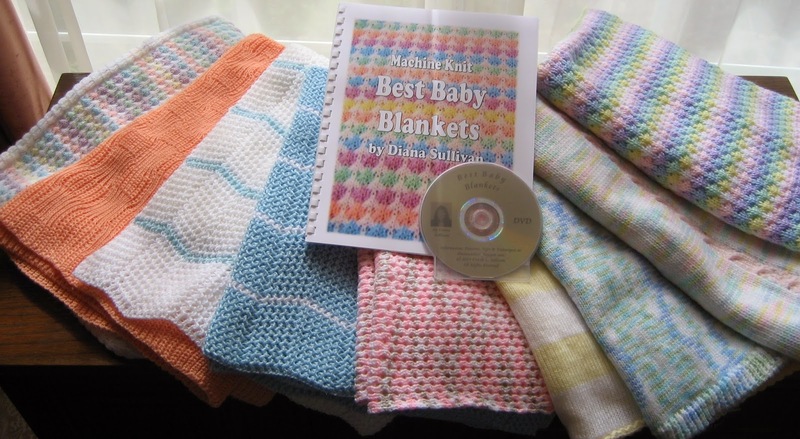 The DVDs are also useful for intermediate knitters who need a reference. That is, if you need a particular technique, you can go to that lesson directly using the menu system on the DVDs and the table of contents on the back of the DVD case. What's included in the DVDs? Cost: $25.00 + shipping. Shipping of additional items in the same order is free. The whole Goldilocks Challenge is about making terrific gifts using worsted yarn on either an Ultimate Sweater Machine or a Japanese bulky machine. The book contains plenty of sizes and it's jammed with important machine knitting technique lessons, as well. The Goldilocks Challenge was all about urging non-machine knitters to try the craft, and therefore, this package contains a tremendous amount of material to help beginners learn to make great-looking knits. In addition, these designs are recipes for success for other knitters who want excellent patterns for their bulky machines. Therefore, the DVDs and book cover cast-ons, bind-offs, two types of latched ribbing, two methods of doing a small buttonhole, and short-rowing. This set with book and 2 DVDs will be priced at $25 plus shipping if purchased from this page using PayPal. Shipping of additional items in the same order is free. These beautiful scalloped lace edgings are perfect to dress up garments, put around blankets and pillows, and run along shawls and stoles. Most of them have a beaded edge that can be gathered on ribbon or I-cord. Diana's preprogrammed lace patterns are very unusual, in that they reduce the number of lace carriage passes, automatically increase and decrease for the fancy edges, and some even have rolled edges, beading, and curves. This is a greatly simplified method of making fancy edges that eliminates the time-consuming, error-prone business of making manual increases and decreases. 1. Detailed instructions on making Brother lace, and in particular, how to make these special automatic zigzag edges. 2. Scalloped lace scarf, using a regular Stitch World Pattern - so you can learn to work with traveling edges even without a specially programmed stitch pattern. 3. 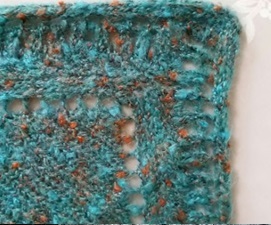 Enchanted Forest Scarf, using the special stitch pattern to automatically increase and decrease along the edge. 4. Lots of beautiful 24-stitch original lace edgings, suitable for either an electronic or 24-stitch punchcard Brother/Knitking machine. The fancy lace edges that made it into the book are Merlin's Mesh, Happy Ever After, Fair Godmother's Lace, Una's Crown, Unicorn Bridle, Sea Serpent, Journey, Eye of Newt, King's Crown, Magic Spell, Curving Path, Tiara, Magic Fans, Little Princess, Fairy Tale, Far Far Away, Dragon's Breath, Rapunzel's Braid, and Into the Woods. To see photos of all these edges, click here. 5. Close-up photo of each edging and a punch or input diagram for each lace. 6. In the interests of a happy ending, the book includes the fairy tale about the bewitched machine knitter. 1. Detailed instructions for a non-traveling lace edging, for a traveling lace edging, and for a multiple transfer traveling lace edging. 2. Video showing procedure for Enchanted Forest Scarf using Stitch World #168 and Diana's method to avoid counting and avoid mistakes. 3. Video showing Enchanted Forest Scarf made the easy way - with Diana's preprogrammed enchanted method. This book has been revised to contain charts for Brother punch card machines, and the DVD now contains instructions for those machines. The book and DVD are $25 plus shipping. Shipping of additional items in the same order is free. The "Beautiful Ribber Scarves" DVD and book are now available! These scarves required more written instructions, charts and diagrams than usual, so we went with an 18-page, 8-1/2" x 11" coil bound, full-color book. On the video, I included all the significant steps for each scarf, even the steps that they have in common. You can choose the scarf you want from the DVD menu and then follow that without skipping around. These scarves are a wonderful way to improve your ribber skills and make something beautiful as you learn. The scarves turned out terrific - you should have heard the gasp when I pulled them out at Knit Natters! I worked hard to choose the prettiest, most practical, and interesting stitches I could, and then make very clear instructions. What's more, when you finish knitting and binding off, these projects are done! Only one or two even benefit from a light steaming - there's no edging, or blocking, or assembly. Burgundy tucked rib scarf - a variation of 1x1 rib and tucked ribbing, using a very simple chart. This one is lacy but lies completely flat. Green English Rib scarf - everyone should learn English Rib. It's a great-looking stitch, simple, easy, elegant, and also lies flat. Purple full-needle rib tucked scarf - You probably have dozens of tuck patterns that you can translate into FNR tuck scarves and other projects. Zigzag scarf - an interesting use of ribber racking to make a wonderful, rick-rack shaped scarf. I've included the cheat sheets with the rack numbers. Red wavy tuck stitch scarf - here's a tuck stitch over 1x3 ribbing, a very fancy closed stitch that knits up very quickly. 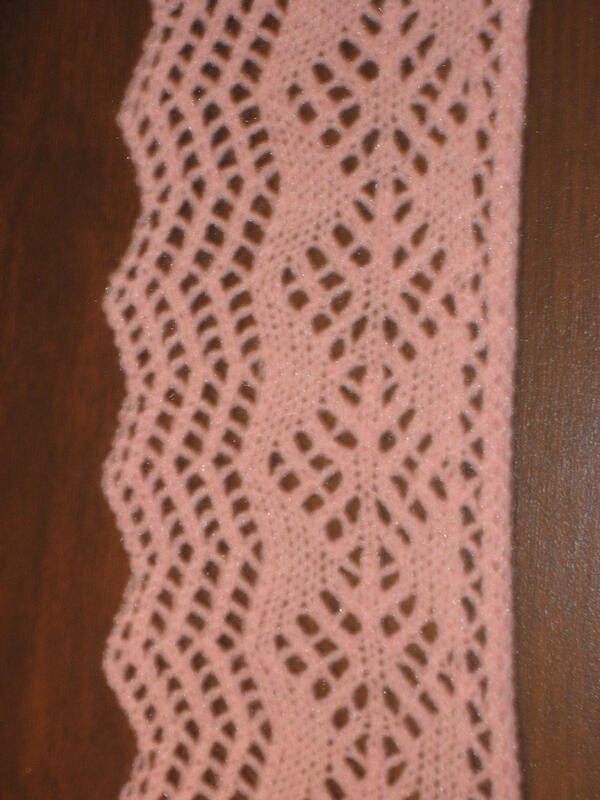 Cream tuck lace scarf - this one is 1x3 lacy tuck that looks a little like butterfly lace and a little like fagotted insert lace. Honeycomb tuck scarf - I got hooked on the honeycomb scarf on the Passap machines, but did you know your Japanese machine can make it, too? Diana's favorite: the light blue "quilted" scarf. This is an unusual technique. You knit circular except for the selected needles, which knit through both layers. It's warm, thick, and would also be an amazing stitch technique for baby blankets, because it's thick and has the quilted texture. This one is big, though, a full 8 ounces of sport yarn. Note the finish on this scarf is a smiles-and-frowns cast-off, closing the top of the tube just like the bottom. The majority of the scarves use only 4 ounces of yarn and make good one-sitting projects. The book and DVD are $25 plus shipping. Shipping of additional items in the same order is free. Here it is - the EZ Entrelac DVD and booklet! Yes, we can knit beautiful Entrelac on a knitting machine! this is a versatile, three-dimensional and fascinating knitting pattern. This method, which uses short-rowing and a circular hand knitting needle, boils down to a simple, clear routine. Why, after a while, you can sit there like me and listen to an audio book...(just finished The Woman in White, bless those Librivox readers). On the hi-def DVD, the first order of business is to demonstrate the Entrelac knitting, piece by piece and step by step. Learn how to start Entrelac, learn the two repeating rows, and learn how to finish Entrelac off. But let's not settle for a mere sample, let's have a nice, eye-poppin', roomy tote to flaunt, so here's the additional knitting for that - gussets, handles, edging, and sewing. Finally, at the sewing machine, I show how to make the cotton calico lining with lots of inside pockets. The video is my usual approach - five clumsy thumbs on each hand (if I can machine knit, anyone can) and my usual detailed descriptions, nose-to-the-machine closeups, and breaking everything down into simple steps. I managed to get the price down to $15! I crammed all the video onto one DVD, and then realized we better have written instructions, so I added this cute widdy-bitty little booklet (12 colorful 5-1/2" x 8-1/2" pages) with the instructions and lots of diagrams. The book and DVD are $15 plus shipping. Shipping of additional items in the same order is free. Finally, master your garter bar! Speed ripping - pull out a whole row in one tug! Have you got a garter bar that you hardly ever use? Probably the most useful but underutilized accessory for knitting machines, the garter bar can make your machine knitting experience easier and more enjoyable, and even allow you to do patterns you didn't think were practical by machine. For instance, the garter bar can make hand-tooling lace fast and practical on a machine with no lace carriage. Diana shows you how to truly master the garter bar and get more out of your machine! These eighteen lessons are all newly filmed in 1080p high definition for a wonderful, clear picture, terrific for enhancing your own skills. Each lesson will make an interesting demonstration for your knit club or students! Packaged in a slimline two-DVD case, $25 plus shipping. Shipping of additional items in the same order is free. Cllick here for shipping and Tax Information, both U.S. & International. How good a sock can be knitted on the flatbed knitting machine? You actually can knit a terrific sock on a machine with a ribber! In fact, the entire foot area, with shaped heel and toe, can be knitted circular with no side seams and an invisible grafted toe seam. A seam is required in the ribbed cuff. You can knit the socks using quality hand knitting sock yarn. Here's how to do it, in all the detail that you need. First of all, in the book, there are seven pages of sock knitting tips and techniques, including information on making socks to fit and doing beautiful finishing. Secondly, there are detailed written instructions for the women's medium size. You can follow those for your first pair and after that, you'll want to work from the one-page chart showing all the sizes from little kids' to big guys' sizing. The pattern chart is printed in color on the inside back cover. Because there are so many sizes given, the columns of the chart are in various colors to make it easy to follow your desired size instructions. The DVD, filmed in high definition 1080p, shows every step in the process, including how to cast on and knit the ribbed cuff, fold, rehang and weight the cuff for circular (tubular) knitting, the necessary steps to do the short-rowed heel and toe, even the finishing seams including invisible Kitchener stitch for the toe. There's a bonus on the DVD that you'll want to try, as well - a method for folding and rehanging the cuff that uses a garter bar and is a big time-saver. Price: $25 plus shipping. Shipping of additional items in the same order is free.